(Newser) – The US Justice Department has decided not to charge two white Baton Rouge police officers in the death of a black man whose fatal shooting was captured on cellphone video, fueling protests in Louisiana's capital and beyond, the AP reports. 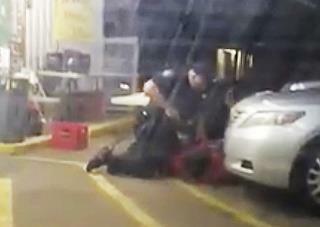 Federal authorities opened a civil rights investigation immediately after the July 2016 police shooting that killed 37-year-old Alton Sterling outside a convenience store where he was selling homemade CDs. The department's decision not to charge the officers doesn't preclude state authorities from conducting their own investigation and pursuing their own criminal charges. "stop resisting" is a good command to follow. Jeff Sessions: "A nigra boy got himself shot. So what? Sh1t, plenty more of 'em where he came from. One less to feed!" The Land Of The Free Unless You're Confronted By The Police.